We make every effort not to take too much for granted living in Fethiye – but sometimes, much as we try not to, we overlook things of beauty that are right under our noses. Daily life throughout the seasons means we just become accustomed to jumping on the dolmuş or the belediye buses to get us from A to B – if it’s too far to walk, that is. 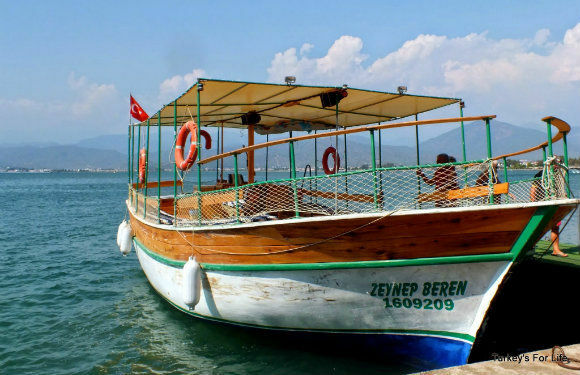 That means, when summer comes along, we often overlook a real Fethiye treasure; the Fethiye to Çalış water taxi. And more often than not, it takes visiting friends to remind us it’s there – they love it, you see! If you are in Fethiye in the summer season and you’re fancying a wander over to Çalış Beach, well, why wouldn’t you go by boat? What a perfect way to travel! And if it’s a night out in Çalış that you’re pondering, not only are you going to get a sail across the bay, you’re going to get a sunset sail across the bay…it just gets better and better, doesn’t it? 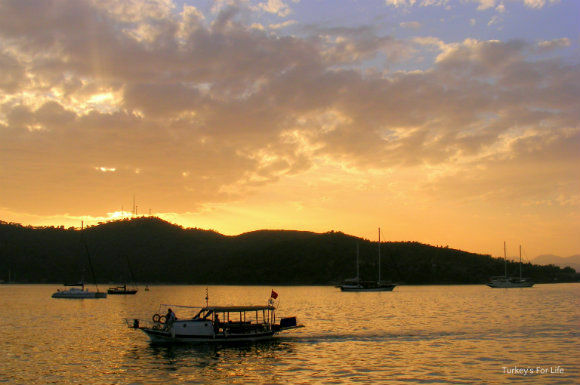 For catching the sunset from the Fethiye to Çalış water taxi, check the sunset times before you set off and try to get a boat just as the sun begins to lower. For us, on this journey, we were on a little double-decker boat so we clambered up to the top deck to get sunset photos of the 40-minute sail across the bay of Fethiye towards Çalış Beach. We were going for a night out at the Çalış tents and this was the perfect way to get there. 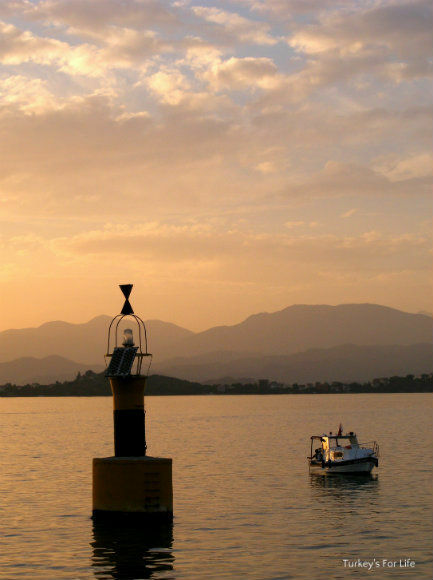 Fethiye is a huge, natural harbour so the sea remains calm more often than not. This means that even if you’re not brave on boats, the Fethiye Çalış water taxi should be great for you – no rocking and rolling about all over the place; just a gentle chug across the water. We know Fethiye bay is beautiful. We know we always enjoy our time on the water taxi. But, when we’re actually on the water taxi, we’ve always forgotten just how lovely this little trip is. One of our visiting friends once even described it as the highlight of his holiday and we’d taken him to different places, all over the Fethiye area. 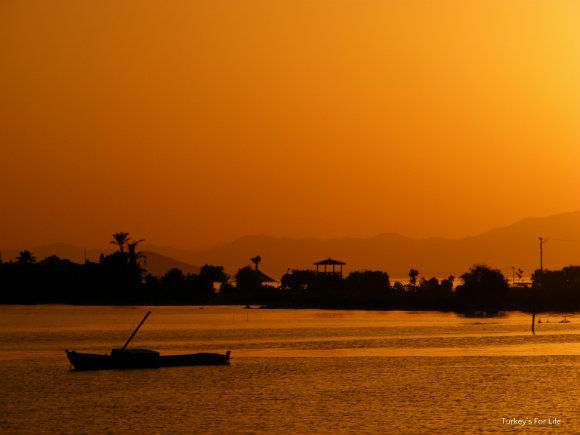 You wouldn’t guess this was a sunset in Fethiye, would you? We’ve got thousands of photos of Fethiye and Çalış in our archives but, until this trip, we’d never taken the water taxi at sunset – a significant addition to the collection then because the sky changes colour significantly as the angles change. The dolmuş boat zigzags between the beacons that guide it through the shallows; one minute you’re facing the harbour, next you’re heading towards Club Letoonia and then, eventually, you reach the canal. 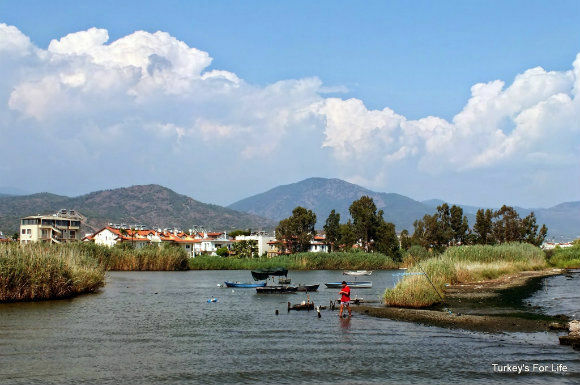 The Fethiye to Çalış water taxi chugs along the canal slowly, being careful not to get grounded, and meanwhile, swallows are darting and diving through the reeds before swooping towards the water and back into the reeds again. After a dreamy little sail across Fethiye bay and gliding through a mini-reeded wilderness, the Çalış water taxi eventually reaches the jetty; passing docked water taxis and day-trip boats. Back to real life with a jolt as you disembark to the sounds of music and jumbled sports commentary spilling out from the nearby Çalış bars and restaurants. So, once you’ve gone from Fethiye to Çalış on the water taxi, that’s it is it? Been there, done it? Well, no. 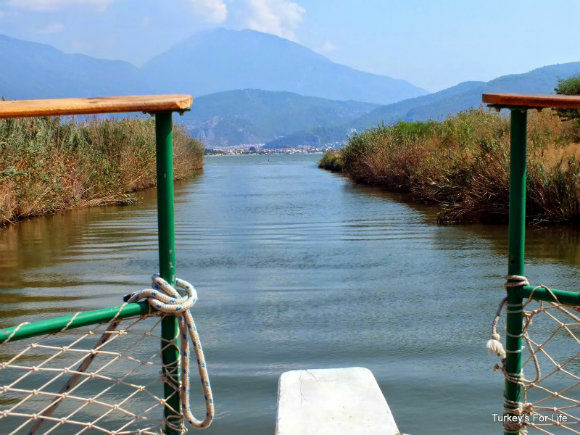 You’re missing out if you don’t go back the other way on the Çalış to Fethiye water taxi. A whole different experience because the scenery before you is of the Mendos and Babadağ mountains and the harbour of Fethiye – and one of our Facebook readers recently described the Çalış Water Taxi as quite simply the best possible way to get to Fethiye Market. Again, we did this trip on a whim. Just about to jump on the dolmuş to take us into town when we looked down at the water, saw the people waiting on the boat and, “Shall we go on the water taxi?” And so we did. Little unplanned journeys are often the best, aren’t they? This time, we were on one of the single decker boats with benches lining the edge of the boat. Time to manoeuvre ourselves to the front so we get photos of the journey from Çalış back to Fethiye. Ahhh, the putt, putt, putt of the boat’s engine, the fishermen wading through the shallows, the 7.50 lira fee for a 40 minute sail across the bay, the refreshing breeze of the open water and occasional spray from the sea as a stray wave slaps against the boat. Yeah, if ever there was a great summer idea for Fethiye, it has to be the Çalış water taxi…and yet we really do make so little use of it. Each time we travel on it, we vow not to leave it so long until the next time. And then we do leave it so long. The Çalış water taxi doesn’t have to be reserved for just for those people enjoying their summer holidays in Fethiye. When the weather’s baking hot, it’s great for us, too. Yes, it’s a few lira more expensive than the dolmuş and the belediye bus, but hey, they’re not ferrying you across a short stretch of the Mediterranean, are they? And, unless you’re fortunate enough to get near an open window, they’re also not giving you a refreshing sea breeze with views all around Fethiye and the marina; gülets moored along the jetty. It’s a more-than-pleasant way to arrive in Fethiye and it’s not something we’re going to do every day. 7.50 TL is good enough for us! Some of the boats even have refreshments for sale so you can enjoy a little drink as you chug along. There is nothing unpleasant about this journey. 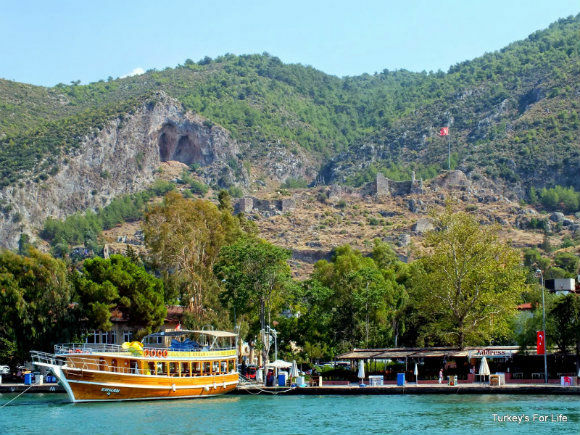 As the boat nears the harbour, Fethiye’s famous Lycian rock tombs and the ancient castle ruins (thought to be a castle of the Knights of St John – but no one seems entirely sure) with its Turkish flag emerge from the hillside and the harbourside cafes and restaurants come into view. 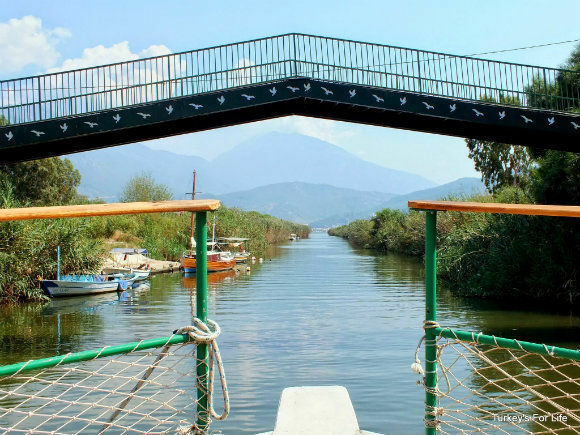 The Fethiye Çalış water taxi runs throughout the summer season between May and October. It runs every 30 minutes, on the hour and the half hour, between Çalış and Fethiye and vice versa. Boards at the ticket booths tell you the times of the last water taxi, both ways. This changes according to low, mid and high season. In Çalış, the Çalış Boat Co-op ticket booth is the conspicuous construction on the canal by the bridge that leads to the beach. In Fethiye, the ticket booth is along the harbour by the children’s park. It’s between Cafe Geniş and Address Restaurant. For the 2016 summer season, the cost of the crossing is 7.50 lira (less than £2) per person. The crossing takes around 40 minutes. The sunset crossing is particularly beautiful. Also, try the night boats from Çalış to Fethiye. The water is completely flat and the lights of Fethiye reflect all along the shore. Fethiye Summer Season Officially Here – How Do We know…? This sounds so incredibly beautiful! I’m definitely bookmarking this for our next trip to Fethiye this August! Such an idyllic location. I know what you mean about taking things for granted where you live. Often it takes a visitor to make you realise what you have! @ Corinne: We’re really conscious of it but it’s inevitable that there’ll always be something we forget about. Nice to rediscover the boat. 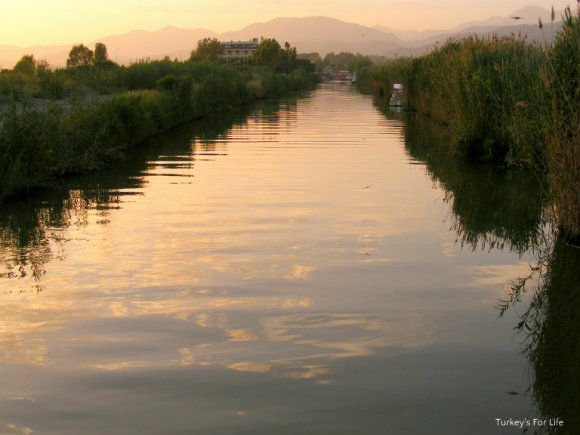 I love getting the water taxi to Calis – so much more convenient and pleasant than the dolmus! Nice Photos. Oh my, this is stunning. 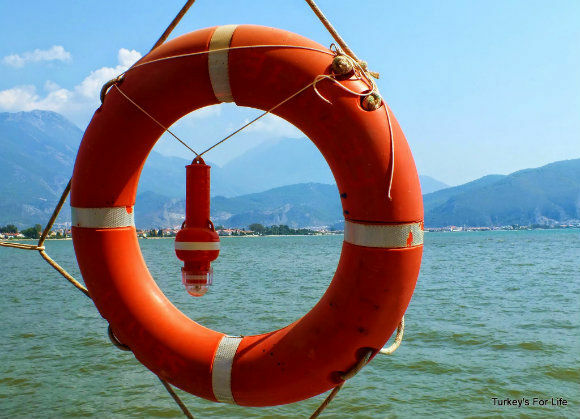 What a great travel tip – Fethiye is on my list if I make it back to Turkey! Does the water taxi have any toilets On board? Most of the Çalış water taxis are now the single decker boats, Sue Cooper, and we’re not sure about toilets on board those. There are toilets on the double decker boats, though. We always use the water taxi from Fethiye to Calis & back, you mentioned the swallows going back & forth , what about all the other wildlife ? Kingfishers, cormorants etc etc. Absolutely adore the area ! Hi Linda, thanks a lot for your comment. Yeah, you’re right, so much bird life around this area. On the day we took these photos, it was just the swallows so we were writing the post from the day. Cormorants in the shoulder seasons. We’ve also got lots of ducks, coots and egrets around at the moment that you might see from the Çalış water taxi too at particular times of year. 🙂 Yeah, a special area and still protected. Is there a water taxi that goes between Letoonia Club Hotel and Fethiye?